The Equus gas and condensate fields are located in the Carnarvon Basin, about 200 kilometres north-west of Onslow in Western Australia. 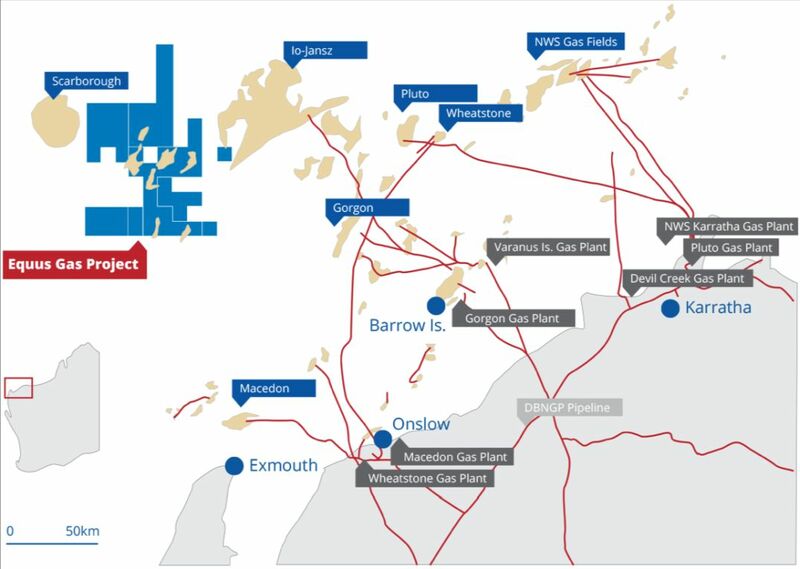 Development of the Equus Gas Project is planned by way of an offshore processing facility, near-shore LNG production and a pipeline to shore, with first gas planned from late 2023/early 2024. Development will be phased, with the initial development comprising three production wells linked by subsea infrastructure to a floating production storage and offloading facility. Facilities on-board the FPSO will include gas dehydration, condensate stripping and gas compression. Dry sales gas will be piped to a nearshore LNG production facility. Sales gas will also be piped on shore for Western Australian domestic gas supply. Alternative development options are being progressed, given the proximity to current and planned infrastructure and the opportunity to collaborate with other resource owners and accelerate gas development.